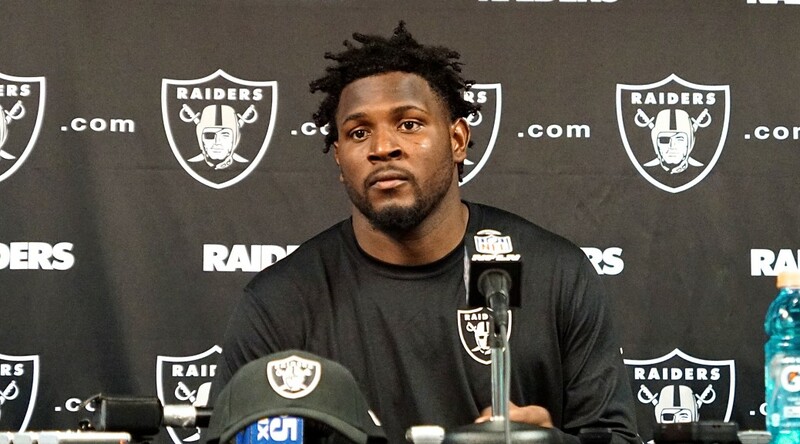 Oakland Raiders Training Camp Preview: Get To Know Mario Edwards Jr.
Alameda, California – With the third pick in the second round, 35th overall, The Oakland Raiders Select Mario Edwards Jr.
College career: Edwards was the No. 1 prospect out of high school, and played three seasons at Florida State. He registered 89 tackles, 23 tackles for loss, eight sacks and three forced fumbles over his career. He was a first-team All-ACC and a second team All-American as a junior. Edwards Jr. is considered a defensive tackle in a 4-3 defensive system that the Raiders use. His versatility may be the best aspect of his game. He can be used as an interior rusher, especially after Antonio Smith was cut. He flourishes in stopping the running game. The Raiders plan to keep his weight around 280-285 lbs. which leads me to believe he will also used as a defensive end. With the versatility of Khalil Mack and now Mario Edwards they could use both in a multitude of ways to keep offenses and opposing quarterbacks guessing. Started 13 games and selected first-team All-ACC in 2014. Did not play against N.C. State after suffering a concussion the previous game (vs. Clemson). Selected third-team All-ACC in 2013 and missed two games with a hand injury. Had a sack in the BCS National Championship Game against Auburn. Only true freshman to start on defense in 2012 after replacing injured Tank Carradine. Rated No. 1 prospect in nation out of high school and was selected USA Today Defensive Player of the Year. His father, Mario, Sr., was a heralded cornerback at FSU and won a national championship in 1999-2000. His father also played in the NFL for five years after being drafted by the Dallas Cowboys (sixth round) in 2000. STRENGTHS: Scheme versatile. Can play base end or defensive tackle in a 4-3 (depending on weight) or as a 3-4 defensive end. Has thick bubble and legs. Comes off snap with decent power. Can brace and anchor at point of attack. Flashes upper-body strength to press and lock out tackles. Above-average closing burst as tackle. Strength to leverage and toss blockers when motivated. WEAKNESSES: Ineffective as pass rusher. Played some stand-up defensive end in college and showed no explosiveness off snap. Play speed and fire go missing from pass rush. Hand usage is hit or miss and appears to lack power with hands. Inconsistent getting arm extension, limiting ability to control and dominate a snap. Too involved in hand fighting and plays through a straw, losing sight of ball carrier. BOTTOM LINE He’s a 3-4 defensive end or a 4-3 defensive tackle who has to make a living playing the run. Edwards failed to reach expectations while at Florida State and ended his career as a core defender rather than dominant force. His “level of ability” is higher than his current level of play and could continue to be the case unless he finds more passion and effort from snap to snap. Q: Did you grow up a Cowboys fan because of your dad? Who did you root for growing up? Q: Were you in the same recruiting class as Menelik Watson at Florida State? Did you come in together? Q: Did you guys overlap one year? Q: How much do you weigh right now? I had read that you are about 272 ppund, at least it was that way at your pro day. Q: Were you surprised that the Raiders called? Did you know that they were in on you? Was there interest expressed at the combine? Q: Are you excited to be reunited with Raiders linebackers coach Sal Sunseri? Q: What’s the weight range that you feel comfortable playing at, because I know you’ve played different positions? Q: Do they want you as an end then at that weight? Q: Did you get caught up in all the pre-draft criticisms about your effort, desire and weight and how do you answer all those criticisms? Q: When you come out of high school as a top recruit, do you think that the bar is set so high that if you statically fall anywhere short of that then you are going to hear about it? Q: What do you think of this role, as the Leo position can have a bunch of different responsibilities? Q: You’ve played in a lot of big college games at Florida State. What kind of an advantage, if any, does that give you over some other prospects? Q: What was the scene like when you got the news today? Where were you and who was with you? Q: How many people do you think were there total? Q: Your dad said you were a little overconfident coming out of high school. Do you think that was true? Q: When did that light come on for you, when you realized you weren’t giving it what you needed to? Q: A lot of scouts think you helped yourself at your pro day. Did it feel like that to you? Entered Florida State as the nation’s No. 1 recruit and lived up to the billing as he developed into an All-ACC First Team selection and All-American as a junior in 2014…appeared in 36 games with 26 starts in his career and had 89 tackles, 23 TFLs and eight sacks. 2014: Versatile second-year starter led the Seminoles with 11 tackles for loss in 13 games, while playing defensive end, defensive tackle and Jack linebacker…also played fullback in some jumbo goal-line packages…All-ACC First Team selection by the coaches and media and two-time ACC Defensive Lineman of the Week…collected Sports Illustrated All-America Second Team accolades…established season-high marks in tackles (44), pass break-ups (5) and forced fumbles (2)…ranked second on the team with three sacks…registered new career-highs with nine tackles against Virginia, including four for losses; also forced a fumble to win second ACC Defensive Lineman of the Week honor…forced a fumble on FSU’s first defensive play and finished with three TFLs versus Wake Forest…able to play on the inside and on the edge on FSU’s defensive line…his 23 career tackles for loss was four shy of FSU’s all-time top 20…appeared on the Bednarik, Nagurski and Lombardi Watch Lists. 2013: Seminoles starter at the right end and a key contributor to the nation’s third-ranked total defense (281.4 ypg) and No. 1 scoring defense (12.1 ppg)…the sophomore was named one of the top defensive linemen in the conference by both the coaches and the media…in his second season in Tallahassee made 11 starts and appeared in 12 games, making 28 tackles…became a major force when it came to splash plays in 2013 with two fumble recoveries, a forced fumble, 9.5 TFL, 3.5 sacks, an interception and a TD return…recovered a fumble and returned it 37 yards for a touch- down at Clemson…had a monster performance in the BCS National Championship Game, totaling a career-high 3.0 tackles for loss in- cluding a sack… had six tackles against Auburn…recorded 2.0 TFLs and 1.0 sacks on four total tackles against Miami…intercepted a pass and made two tackles, including 0.5 sacks, at Wake Forest… had three tackles and then-career-highs with 2.0 TFL, an eight-yard sack and a forced fumble at Florida…posted three tackles in the season opener at Pitt…finished with four tackles and 1.0 tackles for loss against Nevada…made one tackle – a 3-yard loss – and broke up a pass against Idaho. 2012: Appeared in 11 games and made his first career start in the ACC Championship Game replacing Cornellius Carradine…the only five-stars from Rivals, Scout and 247Sports…unanimously ranked No. 1 at his position whether it be defensive end or defensive tackle…the top player coming out of the state of Texas… Scout said it is hard to find a player as big and explosive as Edwards…of his 72 tackles as a senior 32 were for a loss including 11 sacks…named the state of Texas Class 4A Defensive Player of the Year as a junior by the Associated Press…recorded 127 tackles, 50 tackles for loss and 18 sacks leading Denton Ryan to a state runner-up finish…recorded 69 tackles and three sacks as a fresh- man on top of catching 17 passes for 361 yards and three TDs…his high school coach raved about his work ethic as he and his father, former FSU star Mario Edwards, work out together at 6 a.m. each morning…Edwards wears the same number (15) as his dad did at FSU…chose Florida State over Texas, Alabama, LSU, Oklahoma and Oklahoma State, among others. Only true freshman to register a start for FSU on the defensive side of the ball…came into the ACC Championship with seven tackles on the season and doubled that number in one game, registering seven versus the Yellow Jackets, including a tackle for loss… made three tackles and registered his first pass break-up against Northern Illinois in the Orange Bowl in his second career start… recorded his first career sack on the road in a win over Maryland… was projected to redshirt in 2012, but was forced into action due to the loss of Brandon Jenkins in week one and then into the starting line-up after losing Carradine in week 12.